The PROFILE XT® is used primarily for employee selection onboarding, managing, and strategic workforce planning. The PROFILE XT® is a multi-purpose, total person employee assessment used for selection, development, training, managing, and succession planning. 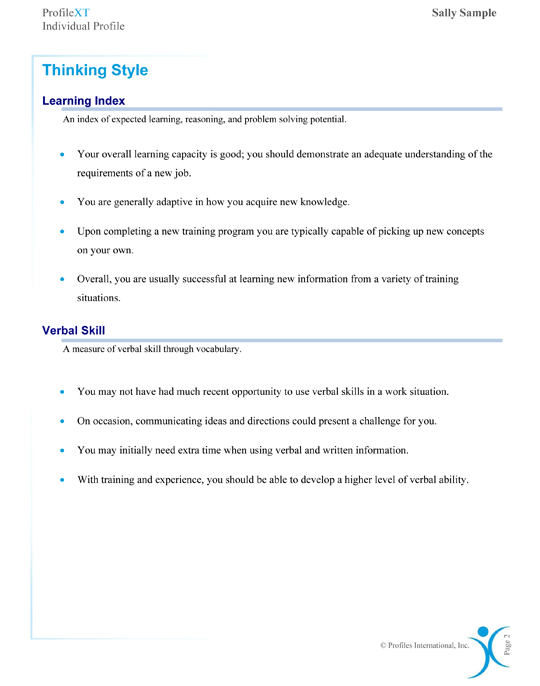 This employee assessment measures how well an individual fits specific jobs in your organization, and the results can be used during the pre-employment training or succession planning stages. PROFILE XT® is customizable, and peak job performance models can be developed by company, position, manager or geography. The PROFILE XT® is used as a prehire tool to find the best-matched candidate for a particular job. 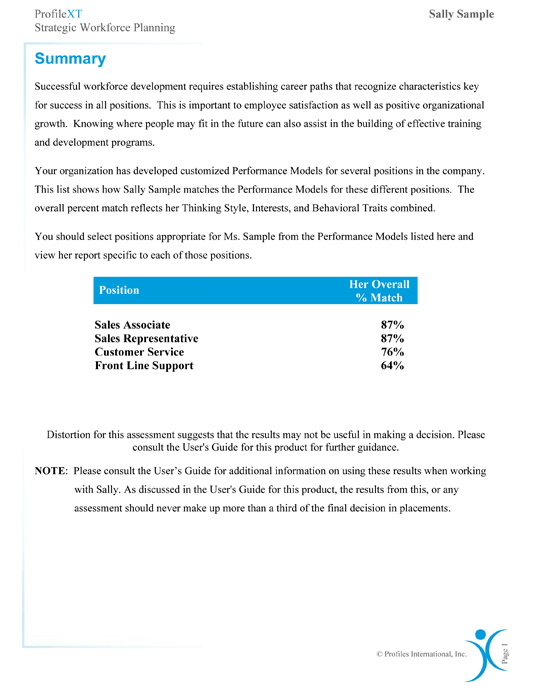 It is also used to develop job descriptions and job performance models. PROFILE XT® reports help managers interview and select people who have the highest probability of being successful in a role, and provide practical recommendations for coaching them to maximum performance. Our company gets a good return on investment from the PROFILE XT® assessment. We've found the product crucial in helping us promote retention and enhance productivity. Your assessments are an important part of our HR tool kit." Useful to the hiring manager. 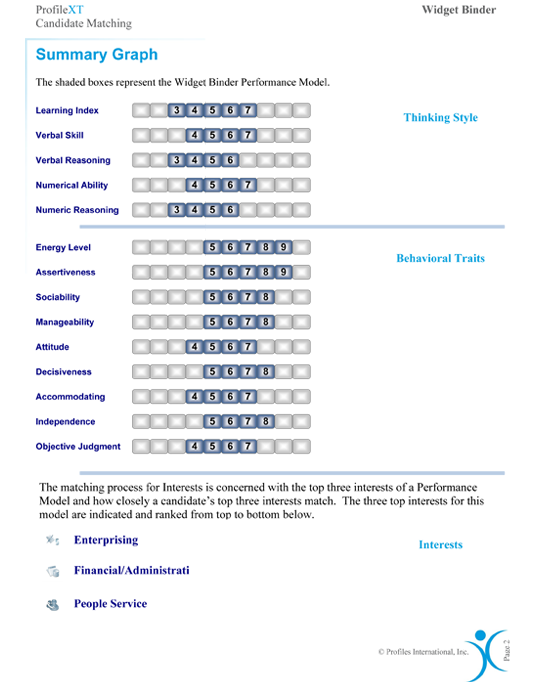 Provides the manager with insights into the person's thinking style, behavioural traits and occupational interests. This report also includes a job match percentage. Provides the employee with a total person overview and occupational aptitudes. 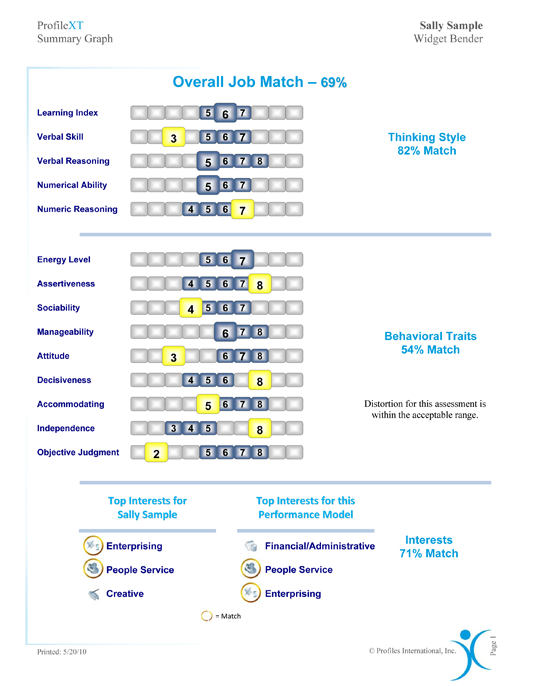 It illustrates the employee's job match percentage to all job match patterns within the company. Provides an overview of all applicants for a particular job and their job match percentages. Return to the Products Page. Video of "Who We Are" and "What We Do"
More Whitepapers & Case Studies . . .